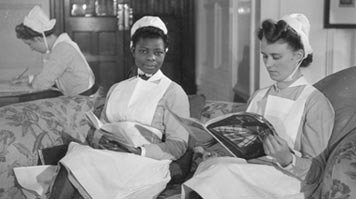 These will include Annie Brewster, who worked at a famous London hospital from 1881-1902; Princess Tsehai, who was employed at the Great Ormond Street Hospital for Sick Children during the London Blitz of 1940/41; and Nigeria’s Nurse Ademola, who trained as a midwife at Guy’s Hospital during the Second World War. In 2015 the community historian Stephen Bourne received the 2015 Southwark Arts Forum Award for Literature for his acclaimed book Black Poppies - Britain's Black Community and the Great War, published by The History Press. In 2017 Stephen received an Honorary Fellowship from London South Bank University for his contribution to diversity. Stephen's latest book War to Windrush - Black Women in Britain 1939-1948 will be published by Jacaranda Books in June 2018. This event is part of our celebrations around International Nurses' Day and NHS70. For more information about other events in this series, please email our events team.